The photo here is a small sample of the information on this heavy-weight laminated card with beautiful, clear, full color photographs and text to help you troubleshoot common difficulties you might have with your Singer Featherweight 221. It is 8 1/2" x 11" and designed to fit right in the front of your Featherweight case. I receive numerous emails (and quite a few phone calls) from people all over the world needing help troubleshooting what could be wrong with their machine. Many times they are on retreat and don't have a manual or large book with them to help. The card is designed to be very durable and fit in the front of your Featherweight case, so you will have it with you when you need help. One side features full color photos of common things such as correct threading, correct needle placement, etc. 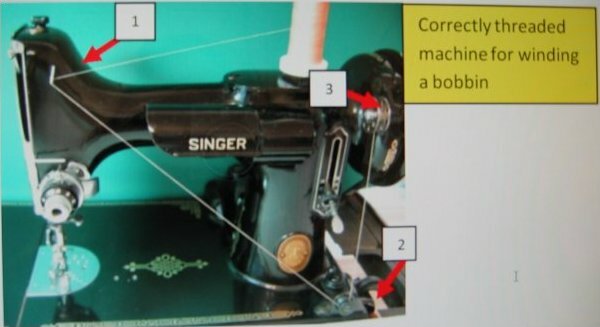 The reverse of the card features troubleshooting prompts such as "machine won't sew - won't make a stitch," "skipping stitches," "motor runs, but machine does not operate," etc. with bulleted items to check and correct. This card is a MUST HAVE for every quilter who takes a Featherweight on retreat or to a 'bee'.